Bedbugs are reddish brown bugs about the size of an apple seed that bite people when they sleep. Bedbugs are not attracted to dirt and grime. They seek warmth, human blood, and carbon dioxide. Anyone sleeping in a room with bedbugs can be bitten. Bedbugs feed for less than 10 minutes and then hide again. They are not known to carry any diseasebut can cause itching and allergic reactions. Tiny black spots along the seams of mattresses, furniture, or clothing. These spots are droppings from the bedbugs. Tiny smears of blood on the sheets. This happens when you roll over and crush a bedbug. What are the symptoms of a bedbug bite? You may see several bites in a line on your skin where several bed bugs have fed. Some people have no reaction at all to bedbug bites. Other people have an allergic reaction that can include severe itching, blisters, or hives. The itchy red bites usually go away on their own in 1 to 2 weeks. Try not to scratch. If you scratch the bites, you may break the skin or get an infection. If you think you may have an infected bite or if you have an allergic reaction, see your healthcare provider. Make a paste of 3 teaspoons baking soda and 1 teaspoon water and rub the area of the bite with it. Put a cold, moist cloth or a bag of ice covered in a towel on the area for 15 to 20 minutes, 3 to 4 times a day. Never put ice directly on your skin. This could cause frostbite. Put hydrocortisone cream or calamine lotion on the area to help lessen itching and swelling. If the bite is still itchy, take an oral antihistamine, such as Benadryl. 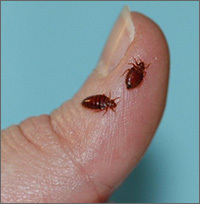 If you have been bitten at home, you must also get rid of any bedbugs where you live. Vacuum everything carefully, including cracks and crevices. Make sure that you dispose of the vacuum cleaner bag right away. Put the bag in a sealed plastic bag to keep the bugs from getting out of the bag. Wash clothes and other items in hot water (at least 120°F, or 49°C). Dry the clothes and other items in a clothes dryer on the high heat setting for 20 minutes. This should kill the bugs and their eggs. You can also put pillows and stuffed toys in the dryer, even if you can't wash them first. Hire a professional exterminator. They may use poison to kill bedbugs or heaters that raise the indoor temperature of a room to 122°F (50°C). If you need to get rid of mattresses or furniture, be careful when you take the items out of your home. You don’t want the bedbugs to spread to other places. Take the furniture to the dump rather than leaving it on the curb. It won’t help to spray furniture, beds, or clothes with insecticide sprays you can buy at the grocery store. These products do not work unless they come in direct contact with the bugs. You can use diatomaceous earth (DE) to kill bedbugs. DE is a special kind of powder that is sprinkled wherever bedbugs may hide. DE is not harmful to humans, but after a day or two, bugs who have contact with the powder die. How can I help prevent bedbugs? If you stay in a hotel or dorm room, check the mattress, headboard, and bed frame for signs of bed bugs. Keep your luggage on the luggage rack. Don’t leave your luggage on the bed or floor. Hang up clothes and do not put clothes in a hotel dresser. After a trip, store luggage in closed plastic trash bags. This kills any bedbugs you might have picked up and keeps them from spreading. Do not bring home used furniture and things left on the curb. Enclose anything stored under beds in plastic.